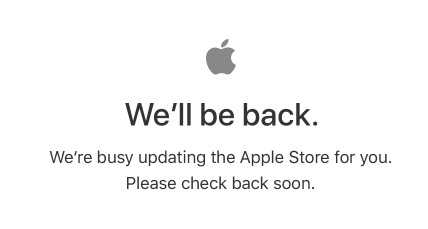 The first piece of news is that the Apple Store is offline. We expect it to come back up soon after the Apple keynote address has finished, so there are going to be new products that we can buy immediately announced at this event. Apple retail chief Angela Ahrendts announces Genius Grove, The Avenue shopping windows and Today At Apple with features like Teacher Tuesdays with new Creative Pros as new posts at Apple Stores like Apple Genius'. Tim Cook has started with the Apple Watch and then after a video with users sharing about how the health features of the Apple Watch, Tim invited Apple COO Jeff Williams to share the news on Apple watchOS 4 features, such as GymKit as well as pushing new health features including heart rate monitoring. Apple watchOS4 will be available on September 19th 2017. Jeff has announced Apple Watch Series 3 which includes cellular so that even if you don't have your phone you can receive your calls and with mobile data you can stream 40 million songs to your wrist. Apple Watch Series 3 will be able to talk to you so you don't need to look at the screen. Even with all the new tech in it, the case of the Apple Watch series 3 is the same size as the Series watch. The Apple Watch Series 3 comes in two versions. One with cellular and Wi-Fi from $399. One with just Wi-Fi from $329 and the Apple Watch Series 1 remains priced from $249. The new Apple Watch Series 3 will be taking orders from September 15th with availability on September 22nd, 2017. The series 3 watch will be available in a range of carriers in countries including US, Australia, UK, Canada, China and Japan. Apple services chief Eddy Cue announced the new Apple TV 4K with HDR (High Dynamic Range) and the new Apple TV 4K will support HDR10 and Dolby Vision. The Apple TV 4K uses the Apple A10X chip, the same one used in the iPad Pro, which will offer up to 2x CPU performance and up to 4x GPU performance. Live sports will be coming to Apple TV later this year, with live news is coming to the TV app as well. 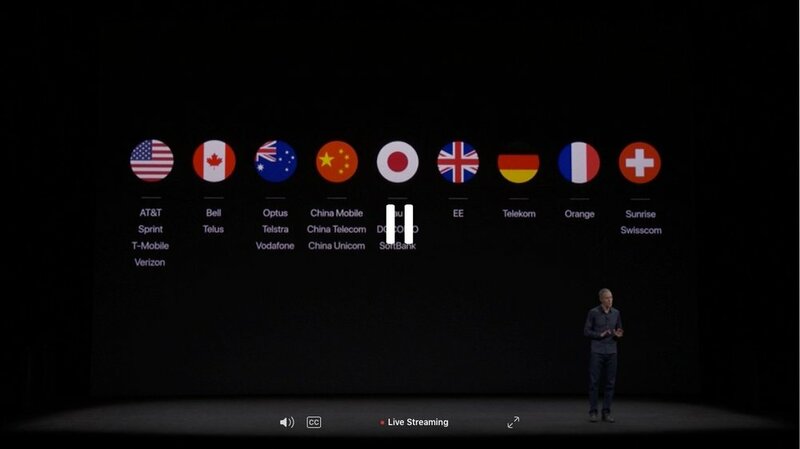 The Apple TV app will be coming to Canada and Australia later this month and other countries later this year. They presented a demo of new Apple TV game from That Game Company called Sky, coming later this year. Apple will be taking orders for the new Apple TV from September 15th with availability from September 22nd, 2017 with prices starting at $179, Apple TV 4K 32GB at $179. and 64GB at $199. The fourth-generation Apple TV will remain available in 32GB for the same $149 - no price cut. The iPhone 8 and iPhone 8 Plus is made of glass both on the front and the back. The Aluminum band matches the finish of each iPhone 8, which will be available in Silver, Space Gray, and a new Gold finish. It is microscopically sealed for water and dust resistance. and will be available with 4.7-inch and 5.5-inch Retina displays and for the first time the display uses True Tone technology. The iPhone 8 and iPhone 8 Plus will have a new A11 Bionic chip. There are two performance cores and will be 25% faster than A10. With four high-efficiency cores, it will be 70% faster than A10 chip. The 2nd-generation performance controller will offer 70% faster multitasking workloads. The iPhone 8 will retain a single-lens camera, whereas the iPhone 8 Plus will have a horizontally-aligned dual-lens camera. The wide-angle lens will have an f/1.8 aperture and telephoto lens has an f/2.8 aperture. Apple marketing chief Phil Schiller announced a new beta feature called Portrait Lighting that will ship with the iPhone 8. You will be able to compose a photo in Portrait mode in the Camera app, The subject can be separated from the background, then machine learning can create facial landmarks and changes the lighting of your face, whilst you are composing the shot. iPhone 8 and iPhone 8 Plus hardware will support augmented reality. The cameras will be calibrated in the factory and have low-light and handle 60 FPS as well as a new gyroscope and accelerometer. With the glass back they will be offering wireless charging as well as supporting LTE-Advanced and Bluetooth 5.0. For the wireless charging, Apple is adopting inductive charging based on the Qi standard. You will be able to pre-order the Apple iPhone 8 and 8 Plus on September 15th and they will be available from September 22nd. As to pricing, the iPhone 8 and iPhone 8 Plus will be available in 64GB and 256GB storage capacities from $699 and $799 respectively. Also iOS11 will be available from September 19th. They have shown the iPhone X called the iPhone 10. It will have a near edge-to-edge display and vertically-aligned dual-lens rear camera, so that will mean there is no Home button. The notch at the top is for the front-facing camera and earpiece. Apple says it will be water and dust resistant at a microscopic level and it will have a Super Retina Display with 458 DPI. Instead of pressing the Home button you will swipe up from the bottom to unlock the phone and tap the screen to wake up the display. If you swipe up from the bottom and pause for a second you can view the multitasking screen. Without the Home button, Apple is introducing Face ID to unlock your iPhone X. It can even work in the dark using the infra red. The A11 Bionic chip has a built-in neural engine to process facial recognition using specialised hardware for the machine learning algorithms. Apple says that Face ID is secure, with protections against spoofs such as a photo of someone's face. The finger print system has a 1 in 50,000 chance of getting it wrong whereas the new Face ID has a 1 in 1,000,000 chance of getting wrong. With all this technology, you can now have animated emojis controlled with your face on iPhone called Animoji that can be used in the Messages app with a dozen to choose from, such as a robot, monkey, cat, dog, and fish. Apple software engineering chief Craig Federighi demoed an iPhone X live and the first one wouldn't unlock but fortunately, the back up worked just fine. The finale in the demo was messaging with talking Animoji between Craig and Tim. Back to the cameras in the iPhone X, it will have a 12-megapixel dual-lens camera with larger and faster sensors and new colour filter. It has a f/1.8 aperture on a wide-angle lens and faster f/2.4 aperture on a telephoto lens as well as dual optical image stabilisation and Quad-LED True Tone Flash. The iPhone X front-facing camera has a TrueDepth camera that allows for Portrait Mode selfies with Portrait Lighting. It will have the same inductive charging based on the Qi standard and Apple is designing a new wireless charging accessory called AirPower that will charge the iPhone 8/iPhone 8 Plus/iPhone X and the Apple Watch Series 3 and the battery life of the iPhone X will be up to 2 hours longer than iPhone 7. Apple is setting up the iPhone platform as the largest augmented reality platform and pushed the iPhone X's green credentials. The iPhone X will come in 64GB and 256GB, priced from $999 and they will be taking pre-orders from October 27th and it will be available on November 3th 2017. The iPhone 7 will remain and will be priced starting from $549. The iPhone 6s remains, priced from $449 and the iPhone SE starting at $349.